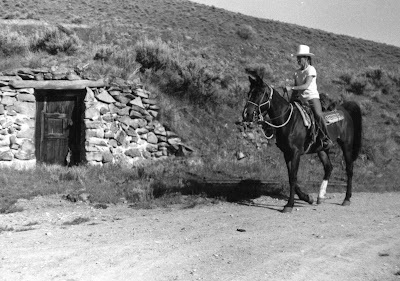 Nikkolis and me heading out our driveway, past our old cellar, to go check cattle. Actually, he was much more imaginative than that. He didn’t spook at his own shadow but rather at much more terrifying visions. I never quite figured out how his mind worked, but riding him was never boring. It was guaranteed to keep you awake — very much awake. 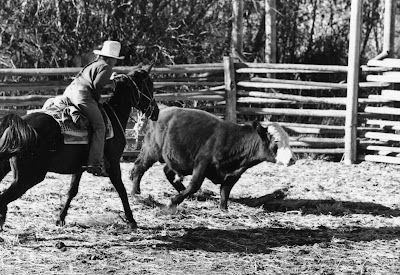 He was my best cowhorse for more than a dozen years (after his mother was gone; he took her place very nicely) and was wonderful to ride if I had to chase cattle through difficult terrain. He was fleet and agile and put his whole heart and soul into outrunning and outmaneuvering a cow, over logs and bogs or crashing through the brush if necessary, and we always got the cow. But if we didn’t need to run after a wayward critter — and his mind wasn’t totally occupied by outsmarting and outmaneuvering a wily cow — he’d think up all kinds of things to spook at. whether outrunning a wayward cow on the range or sorting cattle in the corral. He was such an honest horse that he’d never dream of doing anything really naughty like bucking, but he had great episodes of imaginative spooking and was continually looking for bogeys around the next corner, to make sure they wouldn’t get him. Nikkolis had very keen eyesight, along with a tremendous sense of smell and hearing. He noticed things in the far distance (a deer, another rider, a car moving along the highway in the valley 5 miles down the mountain from where we were checking cattle) long before I did. If my daughter Andrea and I split up to check cattle in a large range pasture, meeting again several hours later at a designated spot, he sensed her approach well before she and her horse came into sight over a hill. I could always tell which direction she’d be coming from; Nikkolis would become very intent on that horizon. He also smelled or sensed any strange animals, pointing out a deer, badger, or coyote before they came into my view. One time he tensed up and centered all his attention on the trail ahead, and when we got around the corner, there was a rattlesnake sunning itself in the trail. No way could he have seen it; he must have smelled it. I always preferred to ride him (rather than a more placid horse) when looking for cattle. He pointed out where they were, even if they were hiding in the brush or timber. If I paid attention to his body language and alertness, I could always find the cows. Perhaps it was his extra sensitivity that played havoc with his well-being and made him spooky, hearing and smelling things I couldn’t. But like the boy who cried wolf, he also threw in some frustrating false alarms. Or maybe he just perceived some things as personal threats and I, being a dull human, just didn’t understand. I’ve tried to imagine the world as he saw it. What was it about a certain creek crossing on Baker Creek that always inspired terror? The trail there goes around a little hill, and off to the side are some cottonwood trees. 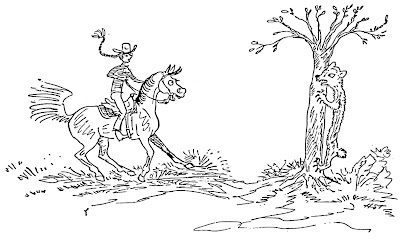 We did see a bear there once, but Nikkolis wasn’t even there on that occasion; I was riding another horse. But something about that grove of cottonwood trees spooked him every time. He made such a habit of these terror-stricken performances that my daughter and I jokingly made up “horrors” for those habitual spooks. We tried to match imagination with his. Perhaps there were bears in that cottonwood grove, but since we couldn’t see them, maybe they were hiding behind the trees. They would have to be very thin bears and quite agile — probably tall, thin bears that quickly sidled around the tree trunks as we rode by, keeping just out of our sight. Perhaps if we had stopped for a moment by the creek crossing we could even hear them growl! that could hide behind the tree trunks, just out of sight. But of course we couldn’t stop that long. Nikkolis might try to balk and not cross that creek, but since that didn’t work (I’d make him go across), he’d dance and prance through the crossing, ready to bolt, impatient to get far away from that terrifying place. Then there were the mud puddles. I never figured out what was so terrifying about mud puddles. If there was any possible way to walk around them rather than go through them (even to the point of being a contortionist) Nikkolis would manage to get around them and not muddy his feet. It was more than just a fetish about keeping his feet clean. There had to be an unseen ghastly horror lurking within that mud puddle, perhaps a slimy green alligator waiting with slavering jaws, ready to snap off any poor unsuspecting foot that inadvertently landed in that mud puddle. Nikkolis wasn’t taking any chances. No way was he going to let any hoof of his stray into that puddle! lying in wait to snap at any unsuspecting hoof that ventured close. I could almost understand that little phobia. After all, there’s no way to tell how deep a mud puddle really is, and there might be a grotty, gruesome reptile lurking down there somewhere in the depths. I can sympathize; as a child I thought there might be monsters under the bed. If Nikkolis always wanted to make a scene at the mud puddles, I wasn’t going to be sadistic and always force him to walk through them. That was nearly impossible; unless the puddle was huge, he always managed to maneuver around it anyway, being so agile, even if I tried to aim him right through it. The only exception was when we chased cattle. At those times of urgency, he was all business, and he knew his job. He knew that I knew that he knew he must get the cow, come hell or deep mud puddles. In those instances he’d keep right on charging at full speed, mud puddle or not — though it might take a slight nudge with my spur. He’d most likely jump it, unless it was too large, and then he’d splash on through. In the heat of battle, he was a very loyal charger and always got his cow. His rider had to be a very good horseman on some of those cow-chasing experiences: riding him could be quite an uplifting experience. 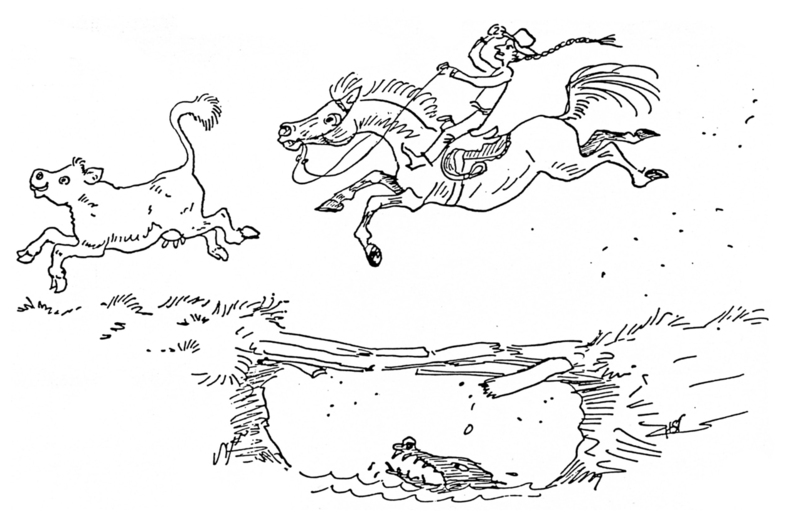 Like the time we tried to head off one old cow to keep her from going across a partly washed-out bridge. She was running in the wrong direction and made a dash for the bridge to get away from us. She had a head start and barely beat us to the bridge and went on across. Nikkolis and I were going full tilt, and there was no time to halt. 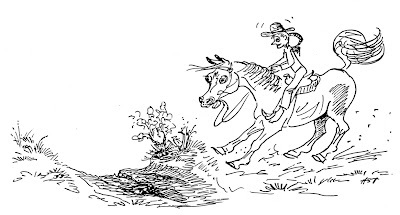 It was one of those instances when you just keep going, mutter a quick prayer, and hope your horse doesn’t put a foot down one of the holes in the bridge. He didn’t. He didn’t take that kind of chance. He’d gone across that bridge a hundred times in the past, but he didn’t know it had partly washed out earlier that spring. Somehow he must have sensed the danger, and rather than take a chance, he merely leaped the whole thing — a broad jump of at least 15 feet. I wasn’t expecting that kind of jump, and my riding form was less than perfect as we landed on the other side. But we made it over the bridge, caught up with the cow, and brought her back. 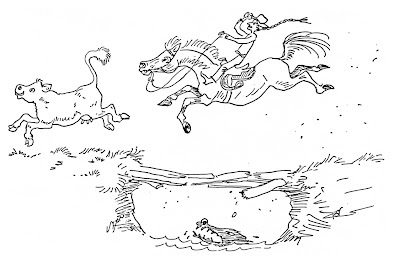 Rather than take a chance, he leaped the whole bridge. I can sort of understand his fear of big wet puddles that might contain lurking alligators in the murky bottom. But what I could never figure out was his fear of dry puddles. In his view dry mud puddles were just as scary as wet ones. I’ve tried to see it through Nikkolis’s eyes. Perhaps if wet mud puddles harbor big wet alligators, maybe dry mud puddles have dry crocodiles lying in wait somewhere down under all those cracks and wrinkles of dried mud. I’m not sure what makes dry crocs more terrifying than wet ones. Maybe, being dry, they are smaller and livelier and more likely to bounce up and snap at an unsuspecting hoof. Or maybe, being dry, their teeth are sharper. I don’t know. I gave up trying to figure it out. If anyone comes up with an answer as to why dry crocodiles and alligators are more deadly than wet ones, please let me know. Nikkolis never bothered to tell me.